I bought these cameras to augment the Defender system I already have in place. They have the flexibility I wanted for my front and back doors. Easy to adjust viewing and worked perfectly with existing system. Had this for a week now, happy with the quality, it's small and well hidden, very easy to install. The system arrived flawlessly. Instructions were simple and easy to understand. Clarity of images is excellent. Programming takes some time but the downloaded manual is great. just got it set up today. hassle free set up for online remote viewing. 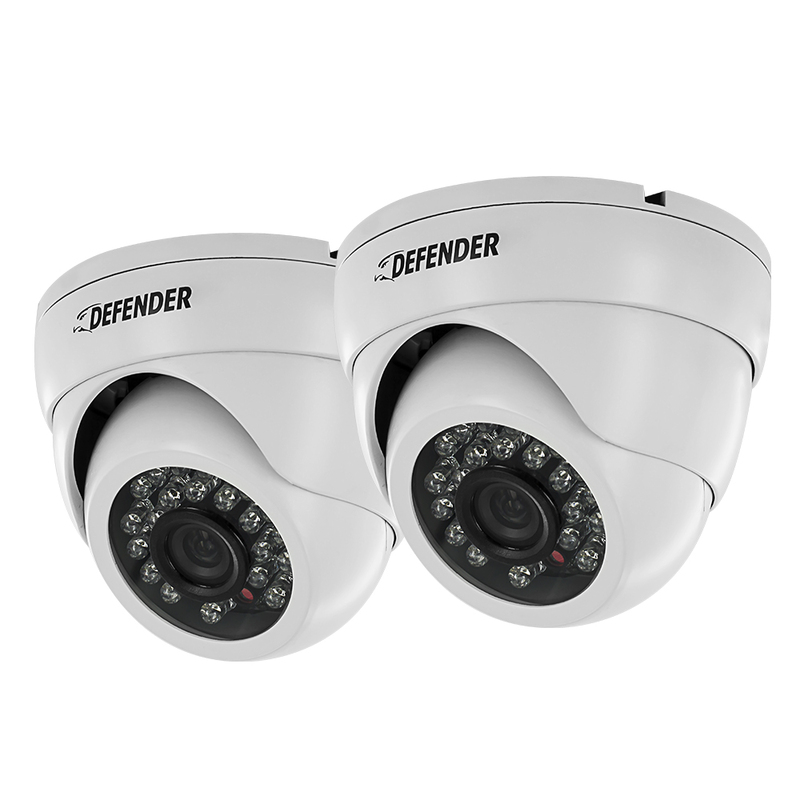 The night vision is great, the daytime color is great, and the cameras are easy to handle. Purchased this product about a month ago. We had a professional security company install ours, they we impressed with the quality and ease of operation plus no monthly fees. This product does what it states it does, and it does it well. After viewing other security systems i know i made the right choice for my family and piece of mind. recently purchased 4 white camers to go with the color change on house. The cameras work great. I highly recommend defender for cameras. I bought this four pack to go inside and connect to what I already have working outside. They were easy to install and work great. Great picture day or night. Easy to install. Easy to adjust. I bought this system in order to catch a thief and vandal - boy was I happy - within 48 hours he was caught red handed - the infra red system worked like a charm and the clear view is perfect for my situation. I had a few small camera issues and the customer service and replacement parts were taken care of immediately and I am very happy with both the product and the service afterwards.. I would recommend in a heart beat - in fact I need to add to my 8 channel system shortly and will be buying additional cameras as needed. These were easy to install and position. The picture, clarity and color is better than the original cameras I bought with the system. I have had issues with a couple of the cameras at dusk becoming foggy and unable to see images, but I am hoping that customer service can help me through this or replace a bad camera if that is the case.